Fishing started off well Tuesday morning with boats getting the early bite at Bird 1 and Parker Point. Action was steady for Chinook and coho through till late morning. The mid-day slowdown was broken up by fishing for some white fish, with easy catches of tasty chicken halibut and plentiful rock cod. Lots of fun on the light rods and jigs. The afternoon salmon bite came on from Green Point through to Shag and action continued for several hours into the evening. Parker Point also gave up a good number of fish for the boats working the area. 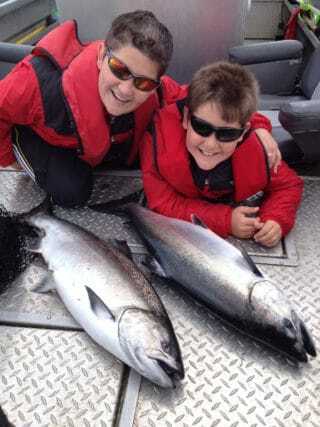 It’s great to see so many young anglers enjoying time on the water with their families. First time salmon angler Nicholas Fisher has definitely got into it this week, catching his first two salmon ever. It just so happened that each of his first salmon weighed 31 pounds! Great job Nicholas! The Tyee bell has seen lots of use this week with a healthy dose of beautiful Chinooks in the 30-35 pound class being recorded. While we haven’t had any of the really big salmon so far this week, last weekend saw a 48 pounder released by Jared Politz and a 49 pounder turned back by Grant Benson. Jacob Trumbull boated a hefty 47 lb Chinook and Jason Hancock a 45. Fantastic fish guys! The 100 pounder Halibut board continues to fill up with some more giants caught and released: Andrew Wong had a 134 pounder, Manuel Bussieres a 155 and Marty Van Drunen measured one giant out to 215 pounds before turning out the hook and watching it swim away! Amazing catches all around!